Cape Town is one of those ‘must visit’ cities. It has the most incredible position on the edge of the Ocean and backed by the iconic Table Mountain. From stunning nearby beaches, to the gardens of Kirstenbosch, the fascinating Cape Malay district of Bo-Kaap and the wonderful V&A Waterfront, it’s an enticing destination. And that’s before you’ve visited the nearby Winelands and Cape Peninsula. Whether taken before or after your Botswana, Cape Town makes an excellent addition to your safari as it’s such a different experience. There’s never a bad time to come, though the weather is generally best from about October to March. You can enjoy the town’s cultural activities, visit famous landmarks such as Table Mountain and Robben Island, head for the nearby beaches at Camps Bay or further afield. You might also want to take time to head out east to the Winelands or south to explore more of the Cape Peninsula perhaps including seeing the penguins at Boulders Beach. We’ve kept this add-on as just offering accommodation and transfers to give you an idea of costs, but we can arrange any services here, and we can suggest a myriad of hotels which might suit you. Simply talk to us about the kind of experience you’d like here, or ask us for suggestions, and we’ll be happy to plan this for you. For more information about Cape Town and South Africa, see our sister site, Tribes Travel. You can direct fly from Maun to Cape Town (or vice versa) twice weekly, or there are daily flights via Johannesburg or Windhoek. We can help arrange these flights for you, but they’ve not been included in the prices quoted. You can come to Cape Town at any time of the year and not be disappointed. Weather-wise, however, the best months tend to be between October and March, when the weather is quite Mediterranean. The hotel has a prime setting on the Victoria & Alfred Waterfront, a popular dining, shopping and entertainment venue, and is a well-known landmark in its own right. 94 en-suite, air conditioned bedrooms are spread over 3 floors, and have tea and coffee makers, minibar, safe and Wi-Fi. All have views of the Alfred Basin or Piazza. Begin each day with a lavish buffet including oysters and champagne and enjoying views of Table Mountain. The hotel has a choice of dining options for later meals including a lovely outdoor terrace overlooking the quay and working harbour, as well as the many restaurants and bars at the Waterfront. When you want a change from sightseeing and shopping, seek out the spa and treat yourself to some pampering, life-enhancing treatments delivered by expert therapists, or, if you’ve energy to spare, burn off some calories in the gym. 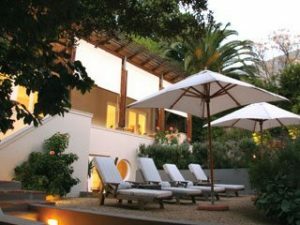 You’ll have free access to the lovely gardens and swimming pool at the neighbouring sister property, Dock House Boutique Hotel. 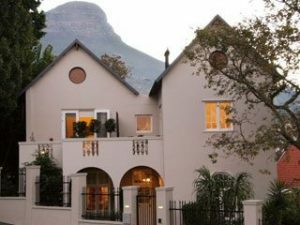 Set on the lower slopes of Table Mountain in a quiet residential neighbourhood, this welcoming guest house is a short walk from trendy Kloof Street and within 10 minutes’ drive of beaches, Kirstenbosch Gardens and the V&A Waterfront. The house was built at the turn of the 20th century and has been thoughtfully converted to provide stylish guest accommodation. The 8 rooms, all en-suite, feature modern comforts and conveniences such as air conditioning, underfloor heating, minibar and snack selection, tea and coffee makers, LCD TV, DVD player, free Wi-Fi and iPod dock. Most have a private balcony, garden or courtyard access. The guest house provides a light continental or full cooked breakfast, as you prefer, with lunches available at the popular Liquorice & Lime café, and several restaurants a short taxi ride away for dinner, though you can request this at the guest house. Away from city sightseeing you can unwind in the pretty gardens, cool off in the plunge pool, indulge in a massage at the spa and browse local artworks in the on-site gallery. Per person prices based on two people sharing. Please ask for single supplements. Plus international flights from roughly £1100 pp. There are many hotels but these are just a couple as an example. On the South African pages our sister site, Tribes Travel, you will find a lot of choice and information about other places to stay here. Please feel free to look there, or contact us for more advice. Flights and taxes, visas, vaccinations, travel insurance, meals not shown, drinks, any activities in Cape Town (though we can help arrange any activities you’d like).